Ikiru is the great Japanese director Akira Kurosawa’s full-blown masterwork and the most perfect statement of his dramatic geometry. The story of this movie is about a petty bureaucrat called Watanabe (acted by Takshi Shimura) working in Tokyo City Administration hall in Japan. He had served the corporation for more than twenty five years as an ordinary clerk engaged in the mundane exercise of numbly thumbing through papers. Nobody even took serious notice of his presence in the office. He is widowed and alienated from his married son. One day this clerk gets a stomach pain and he is admitted to a hospital. After detailed examination and medical tests it is diagnosed that he is suffering from stomach cancer. This sudden collision with stark reality of life benumbs and frightens him. His face assumes a drab intensity that scares people. His eyes are like two translucent cups holding tears that never fall on his cheek. A desolate Watanabe wanders from bars to coffee houses and encounter a young writer and an office girl named Toyo. The writer tells him that life looks much more beautiful to one who is about to leave it than one who is safe and healthy. The girl Toyo is sympathetic to him and advises him to do something meaningful in life. Gradually, the man starts reconciling himself with the immensity of his tragedy and the doom awaiting him. He starts meditating the life he had lived so far and everything unveils in a flash back. He realizes horrendously that the life he had lived so far was sterile, absurd and devoid of any fulfillment. As the illness ripens, we recognize an attitudinal change taking place within him. Despite his illness, we see him emerging stronger with the deep rooted conviction to make the rest of his life meaningful. He takes initiative to build of a children's park which was the dream of the citizens of his town. The sheer enthusiasm, determination, dedication and almost superhuman efforts put in by Watanabe at the fag-end of his life helps to transform a mosquito ridden cesspool into a spectacular park for children. Finally as the dream comes true, the man vanishes from the scene forever. The last scene is the funeral wake where his coworkers though initially try to take credit of the park, slowly realize the sublime sacrifice of Watanabe. They pay eulogies and express astonishment at the transformation of Watanabe from a lifeless clerk into a living legend. They vow to work with the same passion and will like Watanabe. The X-ray image that opens the film "Ikiru" is accompanied by a narrator’s explanation, in voice-over: “This is the stomach of the hero of our story. There is stomach cancer, ...but the man himself doesn’t know this yet.” From a clinical point of view, a tumor has been discovered inside this man. From ethical and philosophical points of view, there remains the unanswered question of what lies inside man. When the writer in the bar asks Watanabe if his stomach hurts, Watanabe replies that his pain is greater than that and he clutches at is chest. The gesture evokes an image of emotional and spiritual pain at the heart of humanity. There is recurring use of dramatic close-ups in this film to show face as a mirror to the individual’s spirit. The film answers the question, and we are shown the snares and delusions to which man in crisis is subject. Watanabe’s first reaction is fear. In bed that night he cries, huddled under his blanket. His second is to lose himself in his family. He cannot. His son — the person closest to him since his wife is dead — has married, become different, alienated. Finding no solace there he begins, for the first time in his life, to doubt; and to doubt means to feel, to begin to live. He doubts the office, doubts his twenty-five years of faithful service and — most difficult of all — doubts his son. Awakened by knowledge of his death (for, as the narrator observes, “he is like a corpse, and actually he has been dead for the past twenty-five years”), it is approaching death which makes him realize for the first time that freedom is his, life is his, has always been his, and that he cannot avoid it. He is alone and free. Our understanding of Watanabe and his self-understanding advance by means of the existential paradox that this spiritless man will discover a meaning in life only on the brink of death. The paradox thus offers a promise and an argument that emerges from the narrative: even a nearly lifeless individual, such as this mummy within the bureaucracy, contains the potential for change and action as long as he is alive. 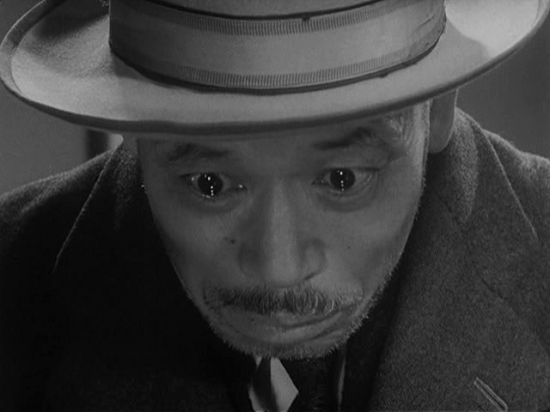 Ikiru's theme bears some parallels with the Judge in Tolstoy's "Death of Ivan Illych" . 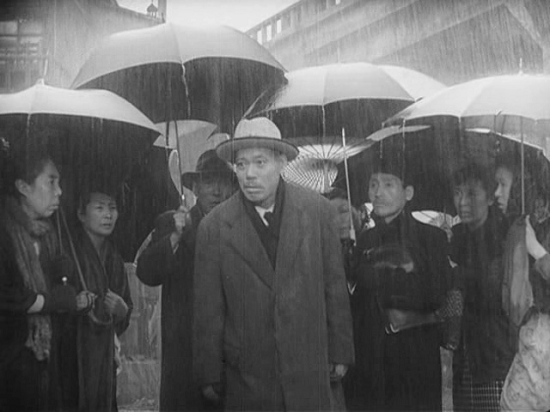 "Sometimes I think of my death,” Kurosawa has written: “I think of ceasing to be...and it is from these thoughts that Ikiru came.” The affirmation is found in the moral message of the film, which, in turn, is contained in the title: Ikiru is the intransitive verb meaning ‘to live.’ This is the affirmation: existence is enough. But the art of simple existence is one of the most difficult to master. When one lives, one must live entirely—and that is the lesson learned by Kanji Watanabe, the petty official whose life and death gives the meaning to the film.